Miracle, the Sacred White Female Buffalo Calf, was born on the farm of Dave, Valerie, and Corey Heider near Janesville, Wisconsin during the morning of August 20, 1994. 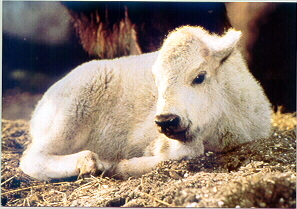 Not an albino, she was considered to be the first white buffalo calf born since 1933. Furthermore, she was extremely important to the religious beliefs of many American Indian and Canadian First Nations tribes. The Lakota, Dakota, and Nakota Nations (known collectively as the Sioux) were considered Miracle's primary spiritual guardians and she played a pivotal role in the fulfillment of their most revered prophecies. However, her place in the prophecies and beliefs of many tribes made her a highly sacred symbol to many of the American Indian Nations across the continent. She was seen by a vast number of people as a symbol of hope and renewal for humanity and for harmony between all peoples, all races, in our world today. Although not American Indian, the Heider family came to view Miracle as a special gift which belonged to the hearts of all people. Commercialization was not allowed. They opened their farm to visitors free of charge seven days a week so that people could visit Miracle at the pasture fence. For safety reasons, visitors were not allowed into the pasture. Miracle was, after all, a wild buffalo as are the rest of the buffalo on the farm. Many people came to offer prayers in her presence, some came simply out of curiosity. Whatever their reason for visiting Miracle and this simple farm, thousands came and few people left unaffected by their time there. Visitors are still welcome to come pray and/or pay their respects at Miracle's grave on the Heider Farm. See the Visitor Information link below for details on visiting. It is the Heiders' hope that this website will help to bring understanding and answer many of the questions people have had about Miracle. For those unable to visit Miracle, much of her life can be seen here. Mitakuye Oyasin.... We Are All Related in the Sacred Hoop of Life. Note: Out of Respect for The People, no links are provided here which will discuss sacred American Indian spirituality issues except generalized information which can be found in numerous places on the web and in popular books or which has been placed on the web by The People, themselves. Miracle's First Guest Books Below Have Been Printed Out and Sent To The Heider Family. See Above for Current Guestbook!